Ideal for photo booth events, exhibitions, conferences and trade show. We offer a choice of sizes and shapes to match budgets and requirements, and to make sure your brand stands out. Old school Portable backdrop Display are those Magnetic Pop Out System. Weight more heavy with those blockout film with stickers on it, magnets and support strips, almost 24kg+. The procedure of making it, is more troublesome and cost more time and material cost. First step is printed on sticker go through lamination then paste onto the block out film, after that paste behind with magnet strips top and bottom part. You need 4 to 5 pieces to form the image. Joining parts can be seen on the overlapping area. Slowly Dye sublimation printing technology improve, many display system are replaced by fabric media at oversea. 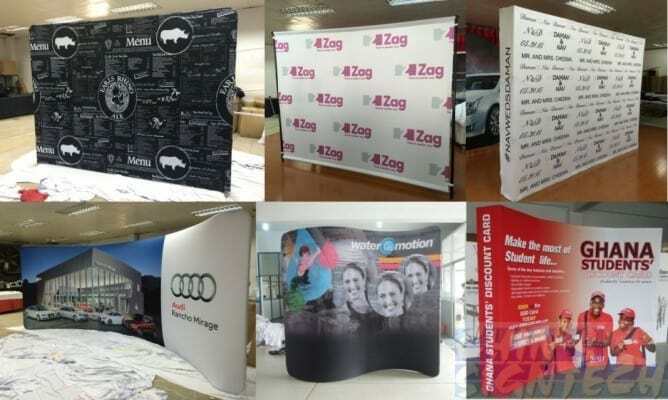 We have huge range of portable Photo Booth Backdrop and Trade Show display systems printed on Fabric for your exhibition display / events. This portable backdrop stands is the most most affordable among all backdrop displays, only cost $300. The telescopic metal tubes can allow user to adjust the graphic size accordingly, printed on PVC or fabric material. These panel have magnet pasted behind the block out film, which can be hang onto the frame. Printed onto 4 to 5 pieces and join together to form a seamless graphic display. Cost $1000 above, weight heavier also. These tension fabric display stands are the lightest display system, doesn’t reflect light, portable, easy to setup and convenient to transport for oversea. Available in C , S , I and B on different shapes and sizes. Cost $900+ above, weight 8.4kg plus. It has an economic price, lighter and Faster assemble than Magnetic Pop up display. Graphics can be printed on a seamless backdrop and then installed the fabric with Velcro. Cost $800+ above, weight 14kg plus and fast setup. Place this curve Fabric pop-up display in your booth and instantly you’ve defined your space and created a warm environment for doing business.